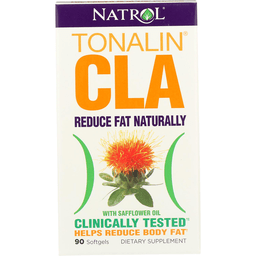 NATROL TONALIN CLA 1200 MG. VITAMIN/SUPPLEMENTS ARE MADE WITH SAFFLOWER OIL TO HELP NATURALLY REDUCE BODY FAT. THERE ARE NO ARTIFICIAL FLAVORS, AND THIS DIETARY SUPPLEMENT IS MADE WITHOUT YEAST OR ADDED SUGAR. THERE ARE ALSO NO EGGS, MILK, WHEAT, CRUSTACEAN SHELLFISH, PEANUTS OR TREE NUTS. YOU'LL FIND 90 SOFT GEL CAPSULES IN EACH BOTTLE. SEE THE NUTRITION FACTS PANEL FOR ALLERGENS.